In 1868, the first flipbook came into picture and now the concept has picked a new platform: A digital one. Now with the new face of flip books, there are new benefits of them. To exploit these benefits, you need a flipbook creator. Here we have a creator that creates the best flip books in minutes to make your audience glued to your site. No programming knowledge is necessary for you to create amazing digital flip books that will grab the attention of your audience. Easy to create flip book with this creator. 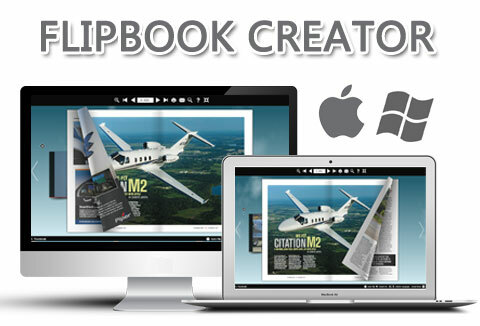 Flip book creator offers self publisher or book publisher an easy and affordable way to meet their digital publishing needs.Flip book creator makes it easy for anyone to create cool 3D realistic Flash flip books without any programming skills. Take advantage of our look & feel settings to change the color and/or pattern of the navigation bar, show or hide function buttons, rapidly apply themes to your flip book, set live paper, pure color or an image as background. Flip book Creator integrates BookShelf tool which could be the best tool to help you build digital library to store and manage eBooks. All books you published on Flip book Creator Server can be collected and shown in your bookcase page automatically, you can easy manage and share the books via using the wonderful and realistic BookCase tool. Available as an instant download after your purchase. Available for Mac and Win versions. Ready to grab this beautiful tool just for $29 today? Please select the version (Mac or Windows) you want from below dropdown!